An all-in-one zoom lens covers a wide range of focal lengths from wide angles to telephoto lengths in a single unit. With the ability to instantly switch the angle of view without having to change lenses, an all-in-one zoom is an exceptionally useful lens that provides more photo opportunities and superb portability. 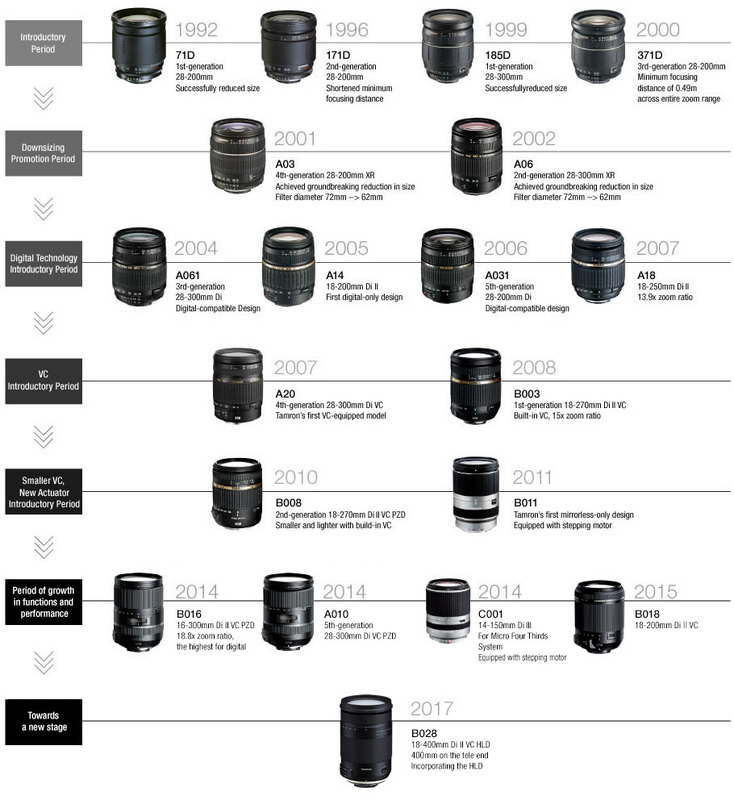 When Tamron first envisaged developing a practical all-in-one zoom lens, it set a goal of creating a lens chassis as small as a cylinder with a diameter as wide as a cigarette packet. Given the conventions governing lens design at the time, this was an extremely challenging prospect. Unfazed, the design team revisited every aspect of a lens, from the selection of materials and optical systems to the design of mechanisms in each component, and in 1992, the process of trial and error culminated in the creation of the first lens in the series, the 28-200mm F/3.8-5.6 (Model 71D). Since then, Tamron's all-in-one zoom lenses have continued to evolve based on the concept of lighter, smaller and more reasonable. The result has been a long line of innovative products that have truly redefined the conventions of lens design. It comes down to striking a balance between high zoom magnification and high image quality. Success in the mass production of compound aspherical lenses provided the way out of this vexingly difficult problem for optical design. 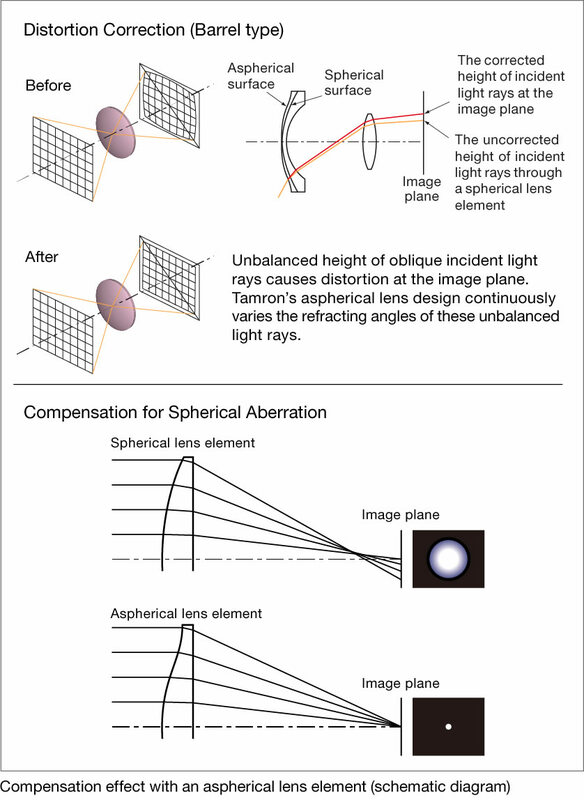 Through the aggressive use of aspherical lenses that were still only used in a subset of specialized lenses at the time of introduction, Tamron gained the ability to effectively correct for various aberrations, such as distortion and spherical aberration. Tamron was also among the first to incorporate specialized glass elements such as LD and AD elements to deal with the chromatic aberration aspherical lenses are unable to correct, achieving sharp, clear and crisp rendering. Tamron has also developed groundbreaking technologies unique to all-in-one zoom lenses. For instance, we succeeded in making the optical system significantly more compact by placing high refractive index XR glass elements in the front group. The widespread adoption of digital cameras to take the place of film cameras has also triggered a major turning point in the optical design of all-in-one zoom lenses. From the film era when the development of all-in-one zooms began, Tamron has employed its unique BBAR coating to ensure high-contrast images by preventing optical reflection on lens surfaces. However, as digital cameras tend to be susceptible to ghosting and flaring from inner reflections caused by the image sensor itself, more advanced anti-reflection measures than had previously been employed were required. In response, Tamron's lens lineup was transformed into the Di Series of digitally oriented high-performance lenses which advanced the transmission factor of the BBAR coating and the optical design greater than before. The range has since developed into the Di Series for both film and digital cameras, the Di II Series for APS-C format digital SLR cameras and the Di III Series for mirrorless interchangeable-lens cameras as Tamron continues to enhance the rendering performance in response to the increasingly high performance of digital cameras. Tamron takes pride in its high-precision multiple-cam technologies, which make it possible to retract a long lens barrel extended to the telephoto end into a compact lens chassis at the wide end with high precision. 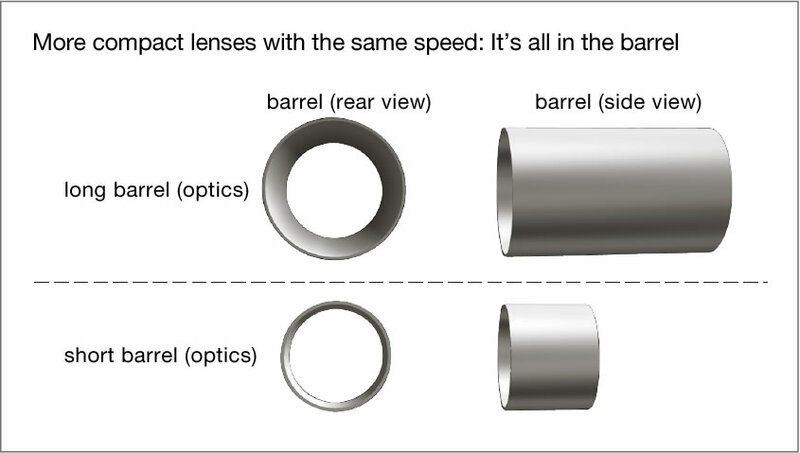 From the outside, it appears that the lens barrel of an all-in-one zoom lens is simply extending with zooming action, but inside, multiple cams are controlling the complex movements of the lens groups associated with the extensive changes in focal length. The high-precision multiple-cam is expertly integrated with an internal focus mechanism that achieves shorter minimum focus distances and improved rendering performance (Integrated Focus Cam), and this extremely complex yet subtle precision mechanism achieves zoom control that boasts a sturdy feel. For the Model B028 ultra-telephoto all-in-one zoom lens covering an even higher telephoto range of 400mm (620mm in the 35mm format), a three-step extension lens barrel has been developed. With the cam divided into more layers than in past models, it has paved the way for smooth, stable zooming operations. Given the very nature of an all-in-one zoom that fits a wide focal range into a single lens, in the course of development Tamron has continuously sought to boost functionality to ensure comfortable operation under all conditions. 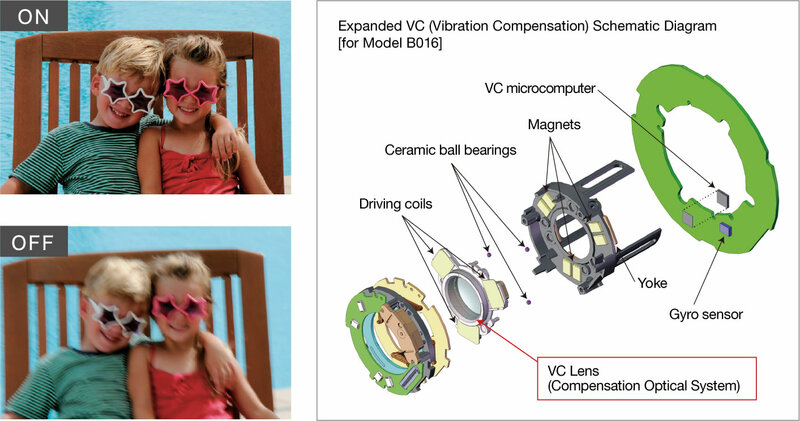 While boosting the corrective effects of our proprietary VC vibration compensation mechanism with optimized algorithms, we have simplified the mechanical structure to help produce a more compact lens. In a bid to achieve lens size reduction and high-speed, silent AF, the PZD has been developed. It features the world leading application of a standing wave ultrasonic motor. 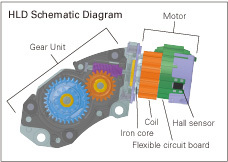 HLD (High/Low torque-modulated Drive) characterized by high precision and high torque has been also developed. Including DC motors that have a proven track record with all-in-one zoom and stepping motors ideal for shooting video because of their low operating noises, the AF drive systems best suited to the characteristics of the lenses are chosen. Tamron builds all the molds used to manufacture key components of its lenses in-house, and those molds requiring particularly high levels of precision are hand-crafted by skilled craftspeople. As a result, each individual component possesses high quality, and these parts are woven together under stringently control to produce a single all-in-one zoom lens. Embracing the proposition of "smaller and higher definition," all-in-one zoom lenses built with constant and uncompromising technological innovation are the culmination of the proprietary technologies Tamron has accumulated. Unlike the shape of a regular spherical lens which maintains a constant curvature, an aspherical lens has a shape with a varying curvature. 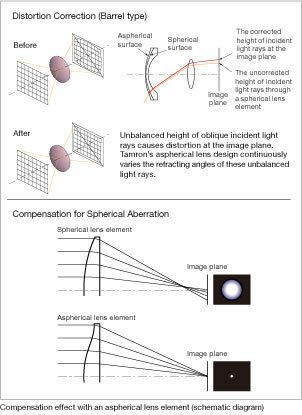 If one tries to correct for aberrations such as distortion and spherical aberration only using spherical lenses, multiple types of spherical lenses need to be combined in multiple layers. An aspherical lens controls the refraction of the incident light rays by varying the curvature over the surface of the lens, allowing it to product corrective effects similar to multiple spherical lenses with just a single lens. Aspherical lenses have been actively introduced since the development of the 28-200mm F/3.8-5.6 (Model 71D), Tamron's first-generation all-in-one zoom lens. By employing aspherical lenses, Tamron has succeeded in removing aberrations and reducing the number of lens elements. One type of aspherical lens known as a compound aspherical lens is formed by pressing a special resin onto the a base material glass lens to form it into an aspherical shape, but at one time technical issues made it difficult to mass produce such lenses. By the time development of the Model 71D had started, Tamron had already accumulated a wealth of expertise in the fabrication of compound aspherical surfaces and succeeded in mass producing aspherical lenses ahead of its competitors in the industry. Today, technologies for glass-molded aspherical lenses in which heat-softened glass materials are formed using a mold created with ultra-high precision machining technologies have also progressed, and Tamron seeks to optimize lens structures with the use of glass materials that utilize their respective characteristics. XR glass use glass materials with a higher refractive index than regular optical lenses, while UXR glass use glass materials that boast an even higher refractive index than XR glass. By placing XR or UXR glass elements in the front group of a lens, overall optical length can be kept shorter. The structure of a regular lens is designed to control aberrations by placing glass with a low refractive index in the front group, but for its all-in-one zoom lenses, Tamron employed a revolutionary lens structure, taking the bold step of placing high refraction lenses in the front group and correcting for aberrations in the rear group. In doing so, it succeeded in improved image quality while further reducing overall lens size. In fact, Tamron succeeded in making the 28-200mm F/3.8-5.6 LD XR (Model A03), the first lens to use XR glass elements, significantly more compact in terms of length, weight and filter diameter compared with its predecessor the 28-200mm F/3.8-5.6 LD (Model 371D). With the use of UXR glass elements in the latest model, the 28-300mm F/3.5-6.3 Di VC PZD (Model A010), the design has been made even more compact. XR and UXR glass serve as a key technology giving Tamron's all-in-one zoom lenses smaller sizes and higher image quality. 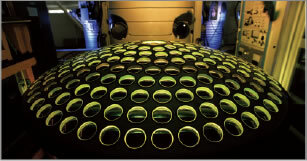 An LD lens is made from specialized glass materials capable of effectively removing or correcting for chromatic aberration using properties that produce extremely low light dispersion due to refraction. 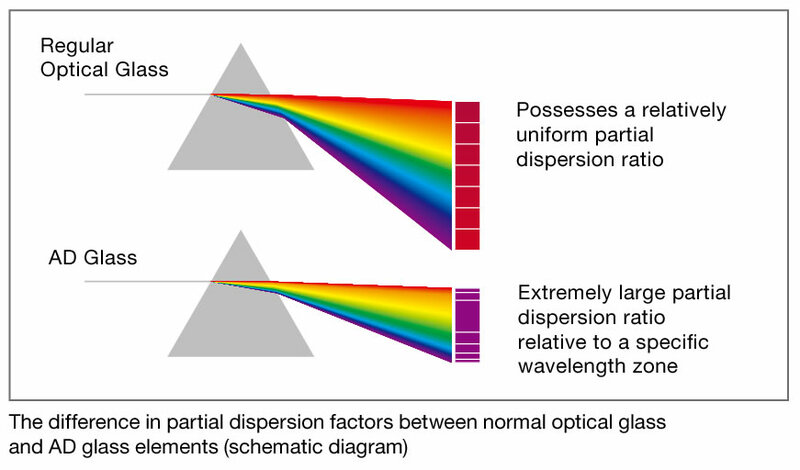 An XLD lens is even less dispersive than an LD lens, exhibiting properties close to those of fluorite lenses. Chromatic aberration that degrades image sharpness in the form of color fringing is caused by a phenomenon where dispersion occurs through the same action as a prism when incident light refracts in a lens (spectral phenomenon where white light splits into its seven constituent colors). 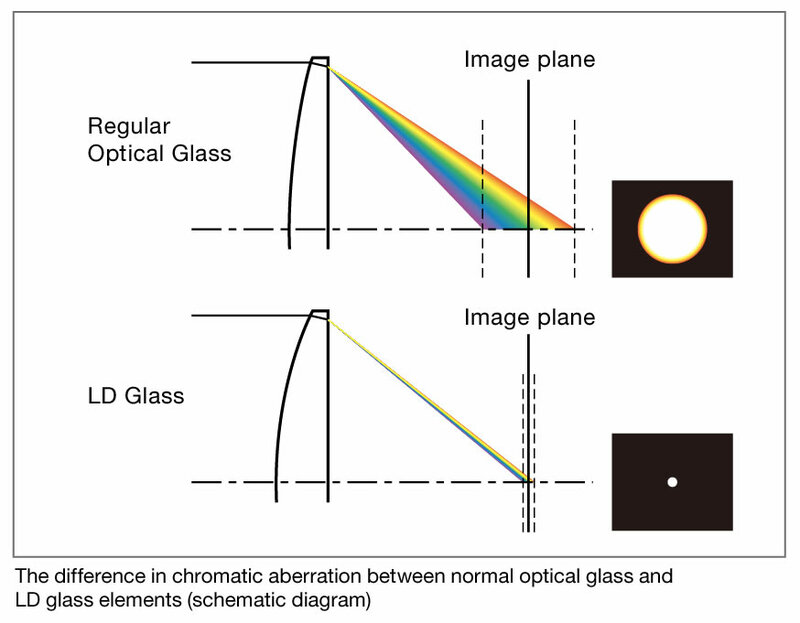 There are two main types of chromatic aberration. 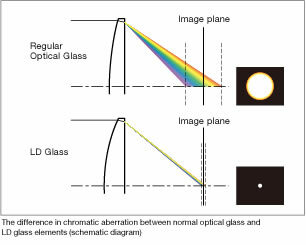 Axial chromatic aberration tends to occur in lenses with a long focal length, while wide-angle lenses with a short focal length are susceptible to chromatic aberrations of magnification. In the design of an all-in-one lens that includes a wide range of focal lengths from wide angle to telephoto, the utilization of LD lenses to reduce chromatic aberrations are important for improving image quality. Tamron was among the first to introduce LD glass elements starting with the 28-200mm F/3.8-5.6 LD (Model 171D), its second-generation all-in-one zoom lens, delivering sharp image quality with high contrast. As with an LD lens, an AD lens is made from a specialized glass material that is effective at removing or reducing chromatic aberrations. 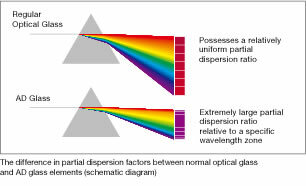 As the partial dispersion ratio (the percentage of a range with a specific dispersiveness) of wavelength ranges within the visible spectrum is abnormally large, in combination with other optical glass an AD lens is able to reduce chromatic aberrations by controlling dispersiveness at specific wavelength ranges. BBAR coating is a proprietary multiple-layer coating technique developed by Tamron to prevent the reflection of incident light on the lens surface as well as flare and ghosting to attain the best possible color balance. 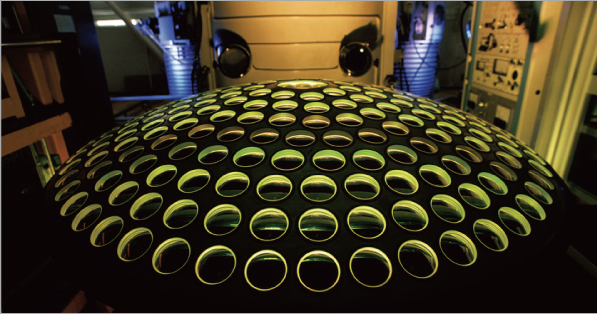 To produce anti-reflection effects across a wide range of wavelengths, Tamron applied BBAR coatings to many of its lenses from early on. Later during the 1990s, Tamron developed a new BBAR coating to respond to the improved image quality provided by film and advances in camera performance. To cater to digital cameras, which suffer from more severe ghost and flaring due to reflection of the image sensor itself, Tamron developed a further evolved version of the coating that increases light transmission across a wider range at both longer and shorter wavelengths. Even more stringent steps have been taken with regard to the latest BBAR coating and these advances have been employed in newly designed lenses. The high-precision multiple-cam mechanism extends the lens barrel from the lens chassis in two steps to enable reliable zooming from wide angles to the telephoto end. When the focal length is changed by zooming, on the outside the lens appears to be extended straight out in two stages, but inside the lens barrel the lens groups that move back and forth in a complex fashion in concert with the changing focal length are controlled by the multiple-cam mechanism. While the high-precision multiple-cam mechanism was developed with proprietary technologies at the early stages of all-in-one zooms, as all-in-one zooms gained acceptance and the calls for expanded magnification ranges grew louder, the cam mechanism needed are more precise construction and greater precision to lengthen the amount of zoom extension. With the 28-300mm F/3.5-6.3 LD (Model 185D), which expanded the focal length at the telephoto end to 300mm, Tamron developed the previously used Triple-Cam Zoom with a three-layer construction into a Quad-Cam Zoom with a four-layer construction and succeeded in fitting a long lens barrel into a compact lens chassis. Combining the sophisticated process of accurately maintaining the lens barrel while containing the high-power zoom mechanism within this extremely complex mechanism and the ability to perform smooth and highly-stable zoom control are also features of the design. As a pioneer of all-in-one zoom lenses, Tamron takes pride in this sophisticated zoom control mechanism. With an internal focusing system, the focusing lenses are positioned from the middle to the rear of the overall lens structure. In conventional zoom lenses, it is standard for the front lens group to extend when focusing, but this method has the drawback of producing a longer working distance. Through the revolutionary technique of employing an internal focusing system offering a favorable working distance in the 28-200mm F/3.8-5.6 LD (Model 171D), its second-generation all-in-one zoom, Tamron succeeded in shortening the working distance of 2.1m in the first-generation 28-200mm F/3.8-5.6 (Model 71D) down to 52cm (at a focal length of 135mm). Tamron has continued to make improvements thereafter, reducing the working distance down to 49cm across the entire zoom range with the release of the 28-200mm F/3.8-5.6 LD (Model 371D) in 2000, and attaining a working distance of 39cm across the entire zoom range with the latest 16-300mm F/3.5-6.3 Di II VC PZD MACRO (Model B016). By combining the internal focus system with the aforementioned high-precision multiple-cam mechanism through the Integrated Focus Cam technology, Tamron was first able to incorporate an all-in-one zoom with a complex zoom mechanism. As well as featuring shorter working distances, the internal focusing system also speeds up autofocusing and is effective at controlling the image quality degradation associated with focusing, making it one of the indispensable technologies underlying improved image quality in all-in-one zooms. VC is Tamron's proprietary optical vibration compensation mechanism, developed to reduce image disturbances caused by camera shake. VC employs a three-coil system where three drive coils electromagnetically drive the optical system that performs correction (VC lens) through three ceramic or steel balls. Correction performance features excellent stability and enables smooth movement with minimal frictional resistance. Moreover, algorithms are optimized to a high level for each lens, ensuring the maximum corrective performance is produced at all times and attaining stable viewfinder images with the ability to track subjects with accuracy. When VC was first equipped in the 28-300mm F/3.8-6.3 XR Di VC (Model A20), a moving magnet system that involved placing a heavy magnetic on the side of the corrective optical system was employed, but this system made it difficult to reduce the size of VC structurally, which unavoidably resulted in larger lens bodies. Given this, Tamron made improvements by switching the positions of the magnet and coil and placing a light-weight coil on the side of the corrective optical system, successfully making the system much smaller and lighter. VC with the moving coil system was employed in the 18-270mm F/3.5-6.3 Di II VC PZD (Model B008), making it the world's smallest and lightest 15x all-in-one zoom lens. This contributed significantly to more compact VC models of all-in-one zoom lenses. Tamron’s exclusive HLD (High/Low torque-modulated Drive) is a new motor featuring high precision and high torque, compactness and low power consumption. The name “HLD” is coined by taking the first letter of several words in its full name, to suggest that the AF drive can be controlled from low to high speed with high precision by adjusting the motor torque. Like DC motors, the HLD is a kind of motor that uses magnetic force into turning force. However, it is structured electrically, not mechanically, switching the current that flows into a coil that generates a magnetic field. This produces smoother rotations and more accurate focus than DC motors do. In addition, the HLD can be compact. That means greater freedom of design of AF modules. The HLD has been introduced to the 18-400mm F/3.5-6.3 Di II VC HLD (Model B028), ultra-telephoto all-in-one zoom lens. 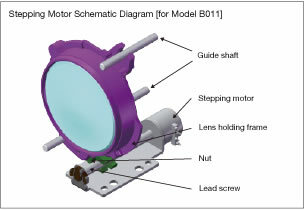 Tamron was the first in the world to successfully apply this type of ultrasonic motor with its characteristically compact mechanism as a lens drive system. By applying high-frequency voltage to the rectangular piezo (piezoelectric ceramic) element, the entire element repeatedly expands, contracts and flexes to generate a swiveling vibration (standing wave motion). This causes the metal tip set at the end of the element to rotate elliptically, causing the rotor at the tip's contact point to rotate and provide the AF driving force. PZD was first equipped in the 18-270mm F/3.5-6.3 Di II VC PZD (Model B008), which successfully achieved a 24% size reduction in terms of volume over its predecessor, the 18-270mm F/3.5-6.3 Di II VC LD (Model B003). PZD provides excellent speed and quietness compared with the DC motor used in conventional all-in-one zooms and enables smoother and more comfortable focusing performance. 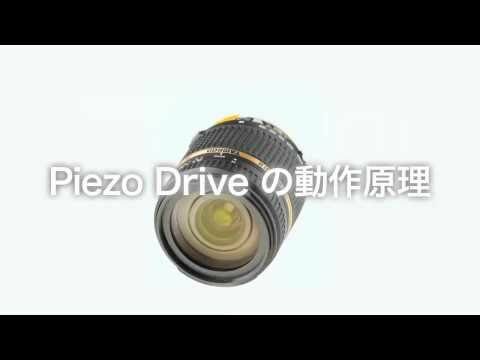 Moreover, in the 16-300mm F/3.5-6.3 Di II VC PZD MACRO (Model B016) and 28-300mm F/3.5-6.3 Di VC PZD (Model A010), the latest models to incorporate PZD, Tamron has enabled full-time manual focus, which allows fine focus adjustments during autofocus without having to switch to manual focus. In this way, Tamron continues to deliver even greater focusing convenience in its all-in-one zoom lenses. The stepping motor is used to drive autofocus in comparatively smaller lenses and allows extremely precise control. 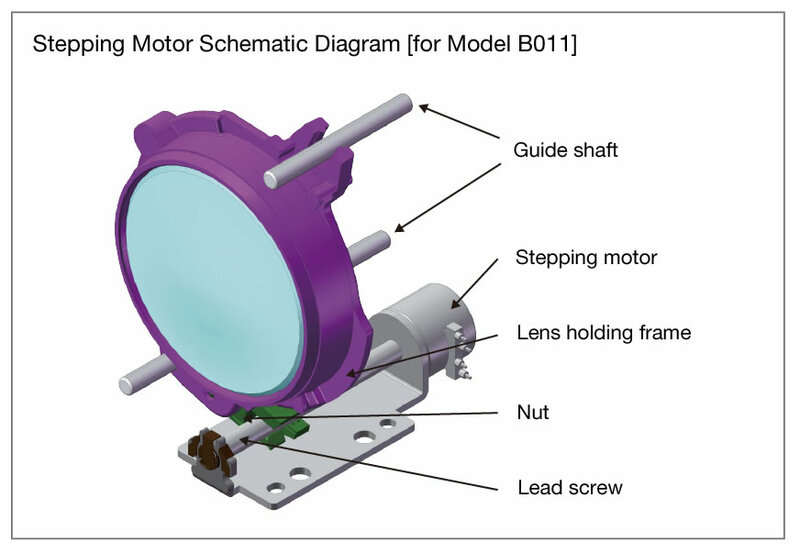 The motor performs one step of rotational movement for each electrical signal (pulse), moving the focusing lens into the designated position quietly and accurately in a single operation. As its simple construction makes it effective for making lens sizes more compact and AF drive sounds are not easily picked up as noise during video recording, the stepping motor is employed in the 18-200mm F/3.5-6.3 Di III VC (Model B011) and 14-150mm F/3.5-5.8 Di III VC (Model C001) all-in-one zoom lenses for mirrorless interchangeable-lens cameras. The DC motor is a technology that enjoys widespread use in everyday life outside its application in AF drives, and utilizes the drive principle of moving a rotor using the forces of magnetic attraction and repulsion. 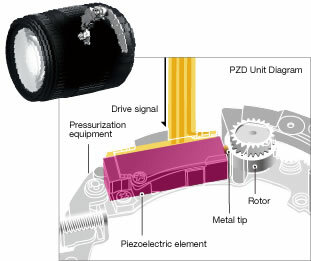 While the newly developed PZD and stepping motor systems enjoy an advantage in terms of drive speed and quietness, as DC motors have practical benefits backed up by a long track record, such as simple rotation control, their ability to easily attain the torque necessary to drive autofocus and their superb cost performance, they have long been employed in many all-in-one zoom lenses.